Festoon Necklace. 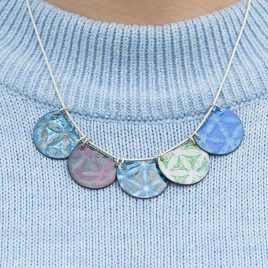 A true stament necklace with segments of coloured and patterned copper enamel. Geometric pattterning creates a contemporary feel to this piece. The five segements have been strung on an 18" sterling silver snake chain. This piece will be delivered in a decorated gift box ready to give or receive with love.